Multi-national, high-speed non-stop metal machine DragonForce are supporting the cause of highlighting the problem of an ever decreasing number of live music venues in the UK that support rock & metal. The band will play a special one off show on Saturday 22nd August at The Square, Harlow in Essex, which sadly is soon to close but is hosting a series of shows under the banner ‘Back To Square One’, by high profile artistes that previously played the venue in their developing years. Days after this show the band are setting off for South East Asia to continue their Maximum Overload World Tour with shows in Thailand, Hong Kong, Taiwan, 3 shows in China and 5 shows in Japan. 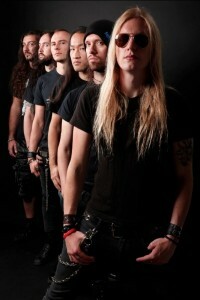 Guitarist Herman Li said ”As a touring band DragonForce cut it’s teeth by playing an array of pubs and small clubs up and down the country which are vital for bands to gain live experience. We are now seeing venues disappear and it’s becoming quite alarming. The Peel in Kingston, The Empress in Bradford, The LA2/Mean Fiddler in London, we played all of these in the distant past but they have all gone, and now The Square in Harlow, which we first played 14 years ago, is about to join them later this year. It’s really very sad but more to the point, it will affect the development of new metal talent in the UK. The promoter asked if we would do a farewell to The Square show and we’re happy to do it to help illuminate this growing problem”. ‘In The Line Of Fire’ will be released on DVD, DVD plus CD, and Blu-Ray Formats.